Established in a two-car garage in 1961, Automotive Fasteners has grown into a global supplier with over 125 employees and nine locations in six states occupying more than 115,000 square feet. Still a family-owned, certified small business headquartered in Greensboro, North Carolina, AF now has the largest inventory of brand name fasteners and industrial supplies in the southeast, stocking more than 64,000 items at each of its nine facilities located in North Carolina, Virginia, West Virginia, Maryland, Georgia and South Carolina. Initially serving freight carrier motor pools, the company quickly expanded to supply Maintenance and Repair Operations in various industrial markets. By the mid-1960's the company diversified beyond fasteners and soon became well-known both nationally and internationally as a supplier of a wide array of leading product brands. Having built a dynamic infrastructure from the outset, the company continued to expand year by year by diversifying its products and providing custom inventory management programs to OEM and MRO users. Before the concept of “Just in Time” became a buzzword, AF provided JIT service directly out of its trucks. 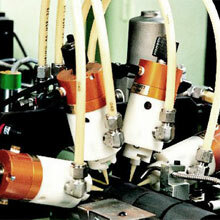 In early 1990 at a customer's facility, AF implemented its first proprietary In-Plant Storz™ inventory management system. The fully integrated version that includes the AF CAGE™ custom inventory management software solution for total automation was implemented in 1991, followed shortly thereafter by the first Integrated Supply Program. The popularity of AF's inventory solutions led to the formation in 1997 of the IMS Division, dedicated solely to the innovation of supply chain management solutions. In 2004, in response to the needs of a principle Tier 1 automotive facility, the Tote Fill™ fully traceable bin filling program was developed. Continuing to respond to the needs of the customer, AF developed the Remote Tote Fill™ (RTF™) program in 2008. From counter sales to Fortune 500 managed accounts, Automotive Fasteners currently serves more than 8,000 customers domestically and around the globe. With the flexibility of being privately-held and family owned, Automotive Fasteners is able to respond to the needs of customers quickly. Without a board of directors to hold us up, AF is able to partner with you every step of the way to provide more than just fasteners and industrial supplies, but actual cost saving solutions that allow you to enhance the way you do business. Based on real customer needs and actual occurrences, AF continues to expand product offerings and develop innovative yet practical Inventory Management Solutions. From material and part selection to supply chain management, AF has the years of cross-industry experience and product knowledge you're looking for in a partner.